Diane Pub Co, 1993-06-01. Hardcover. Good. New York: McClelland & Stewart. Very Good in Very Good dust jacket. 1993. Hardcover. DJ is edgeworn and now in mylar protector. ; 11.25" tall . Diane Pub Co. Used - Good. Former Library book. Shows some signs of wear, and may have some markings on the inside. Toronto: McClelland & Stewart, 1993. 160p., colored and b/w illus., quarto format, dj. Toronto, Canada: McClelland & Stewart Limited, 1993. Large quarto. 160 pp. with numerous colour photos. Colour photos on endpapers. Red cloth with gilt titles. Illustrated DJ, not price-clipped. 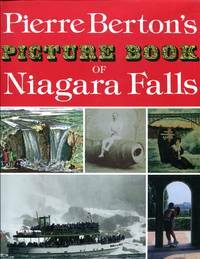 Near Fine/Near Fine..
A Picture Book of Niagara Falls. Toronto. : McClelland & Stewart., 1993.. First edition.. Hard cover. . Fine copy in fine dust jacket (in mylar). . 4to.. Illustrated in black, white and color. Important reference work. . Photograph of OUR copy available upon request. Toronto. : McClelland & Stewart., 1993.. First edition.. Hard cover. . Fine copy in fine dust jacket (in mylar). . 4to.. Illustrated in black, white and color. . Photograph of OUR copy available upon request. McClelland & Stewart, Toronto, 1993. Hardcover. Near Fine / Near Fine Dustjacket. 160 pages, 9"x 11". "In this visual feast, . . . are some of the first photographs ever made at Niagara-daguerrotypes, ambrotypes, and wet plate studies." Westminster, Maryland, U.S.A.: McClelland & Stewart Ltd., 1993. Book. Very Good. Hardcover. 4to - over 9¾ - 12" tall. Jacket spine is a shade faded, very little wear overall. Quite clean. 'In this visual feast, . . . are some of the first photographs ever made at Niagara-daguerrotypes, ambrotypes, and wet plate studies. The legendary daredevil Blondin is here, of course, teetering on his tightrope, and so is Annie Taylor, the first person to go over the Falls in a barrel.' etc. Illustrated. 160 pages..
Toronto, Ontario, Canada: McClelland & Stewart, 1993. Book. Illus. by Various Contributiors. Very Good. Hard Cover in the Dust Jacket. Not Stated... 1993 , Edition not stated , Hardcover in the dust jacket , 160 page book with many color and black & white illustrations . Condition : Very Good with light corner bumps. Size: Folio - over 12" - 15" tall. Westminster, Maryland, U.S.A.: McClelland & Stewart Ltd, 1975. A near fine red oversized hardcover in a very good plus dust jacket. Hard Cover. McClelland & Stewart, 1993-09-01. Hardcover. Very Good. Toronto, ON, Canada: McClelland & Stewart Ltd, 1993 Dj has very light rubs and edge wear. Small remainder mark bottom edge. . Hard Cover. Very Good/Very Good. 4to - over 9¾" - 12" Tall, 160 Pages. Westminster, Maryland, U.S.A.: McClelland & Stewart Ltd, 1993. Book. Illus. by b&w and Color Photo. Very Good. Hardcover. Not Stated.. Size: 4to - over 9¾" - 12" tall. McClelland & Stewart. Used - Like New. Ships from Reno, NV. Book in almost Brand New condition. 100% Money Back Guarantee. Shipped to over one million happy customers. Your purchase benefits world literacy! Toronto: McClelland & Stewart. Very Good+ in Very Good+ dust jacket. 1993. Hardcover. 0771012144 . In VG+ DJ; Red cl. Illus (color & B&W photos, paintings, ads, etc) ; 4to; 160 pages . McClelland & Stewart Ltd, 1993. Hardcover. Good. Tall hardcover. Sound & nice copy, light to moderate edgewear. Jacket is nice, light to moderate rubbing/edgewear, minor chipping at edges. May not be available for international shipment at usual rates due to weight/size. McClelland & Stewart Ltd, 1993. Hardcover. Very Good. Tall hardcover. Sound & nice copy, light to moderate edgewear. Jacket is bright & clean, light to moderate rubbing/edgewear. May not be available for international shipment at usual rates due to weight/size. McClelland & Stewart Ltd, 1993. Hardcover. Good. Tall hardcover. Sound & nice copy, light to moderate edgewear. Jacket is bright & clean, light to moderate rubbing/edgewear, price clipped. May not be available for international shipment at usual rates due to weight/size. McClelland & Stewart Ltd, 1993. Hardcover. Good. Tall hardcover. Sound & nice copy, light to moderate edgewear, writing at second inside page. Jacket is bright & clean, light to moderate rubbing/edgewear, not price clipped. May not be available for international shipment at usual rates due to weight/size.